This strategic partnership has been created to achieve the objective of equipping adult trainers and adults with new knowledge and tools for them to start developing innovative and sustainable projects in a collaborative way; this will also foment entrepreneurship and social inclusion among local citizens. 1.To design a new and innovative Dragon Dreaming Methodology: This will be done by sharing the best practices. What causes a new project to fail are insufficient confidence level and inadequate or non-existent tools and methodologies. Dragon Dreaming methodology clearly provides solutions for the organisations to solve this problem. -they will prove especially useful for working on topics such as inclusion of adults with fewer opportunities. 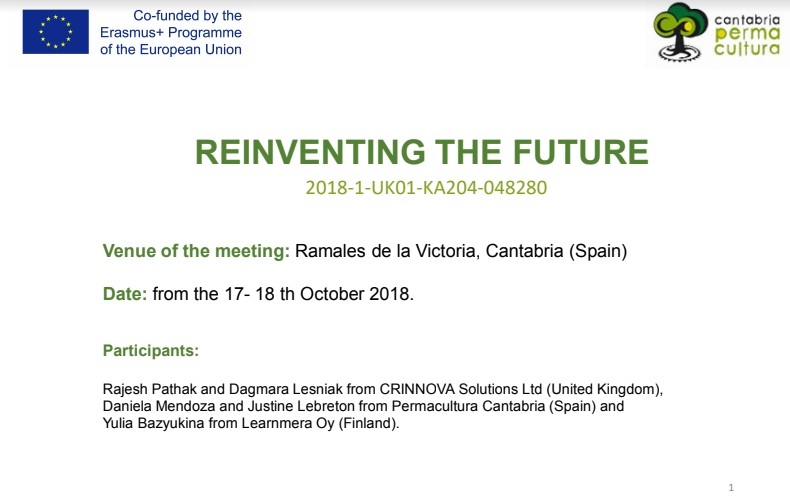 -Kick off meeting in Spain.It was planned for September 2018, but we did it on October. The best practices exchange will be the basis for the creation of a new Dragon Dreaming Methodology with more inclusive, motivational and entrepreneurial features. Adult trainers and adult learners will have an easy way of learning this new methodology through an interactive book and a film (intellectual outputs) which will be created by our strategic partnership. 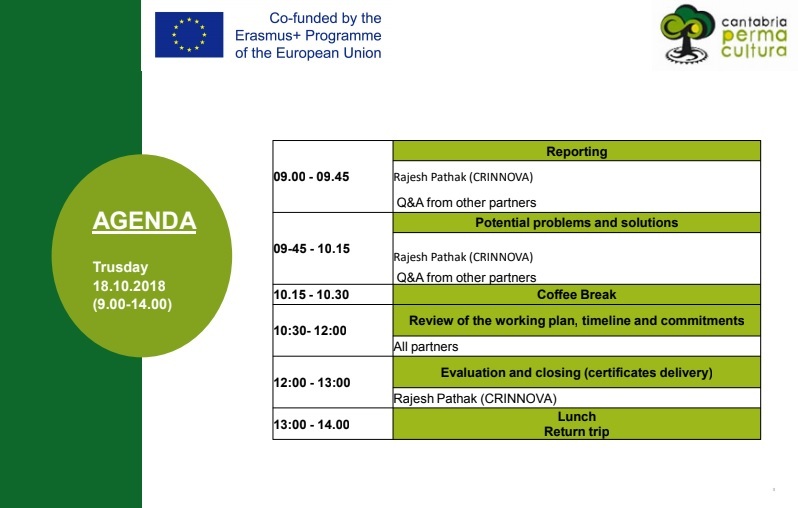 c.2) A3-day participatory visit in Finland where Learnmera will share their good practices, initiatives and programmes about motivation and entrepreneurship for adults. c.3) A10-day course in Spain will be carried to test the effectiveness of the methodology and the interactive book. It will be attended by 10 participants of each entity, who will learn and experience a participatory and creative technique for project design and entrepreneurship called “Dragon Dreaming”. Celebration of one conference per country, followed by a workshop. 40 attendees per country, relevant stakeholders + mass media. e.1) The knowledge and tools acquired during the course will be further transferred onto other adult trainers and adult people through internal workshops, which will be organized by the direct participants of the training. This, along with the new methodology and intellectual outputs, will result helpful in the new project creation activities which will be carried out by local society members. Each organisation will carry out 4 internal workshops (1 Phase each workshop: Dreaming, Planning, Doing and Celebrating) in which they will create projects that will go through these phases. These new projects will look forward to having a positive impact and benefit the adult and our society. e.2) We will carry out a dissemination campaign involving the participation of main stakeholders to maximize the exploitation of the results and intellectual outputs (interactive book and film). (At least 67 entities contacted per country). Coordinators: Oscar Argumosa and Carmen Solla. The hosting organisation will be responsible of logistical preparation during for learning activities: Arrange participants’ accommodation, Kitchen Service, Risk Prevention (Safety and Protection Measures), Preparation of Participants, Transportation Management during the activity. **Linguistic Preparation: As speaking English is one of the requirements the participants must comply, each organisation will support them to issue the Europass Language Passport. In this way, we will be able to analyse their English level in order to see if someone needs additional English assistance before the activity. Each organisation will be responsible to provide English Classes or/and tools for those who require to increase their level before their travel. Preparation regarding the project- We will send an info pack that includes a project summary and course programme to each organisation. A meeting in person will be held, so the adult trainer project coordinator from each organisation can explain the participants all the details regarding the project and the course in Spain. Preparatory Meetings- The adult trainer project coordinator in each organisation will arrange all the necessary meetings with the participants in order to prepare all the tasks of the project. After learning activities, adult trainers and adult leaders taken part on mobilities should conduct the internal workshop. The interactivebook will be between 70- 80 pages long. **Unit 6: Succesfull projects need strong teams. The 4 personality archetypes and their importance. The final product of the output will be an interactive book in English, Spanish and Finnish. This interactive book will include multimodal features such as sounds, animations, videos, etc. The interactive book is a good solution for catching adults’ attention to read the whole book and motivating them to start a new successful sustainable project. The writing of the interactive book will be collaborative. We will proceed with the interactive layout of the booklet. During the participative visit to Spain, the book will be evaluated and tested. 1.1. History, Culture and Tools of Dragon Dreaming. 1.2. Deep listening and Charismatic Communication. 1.3. Dragon Dreaming Wheel: 4 phases. 1.4. The DD Wheel in 12 steps and force field. 2.4. Project curve and motivation team development. 3.1. Knowledge of Dragon Dreaming. 3.4. Meta goal of the project. 4.1. Work planing. Karabirt 1. 4.2. Work planing. Karabirt 2. 4.4. Regenerative economy and Fundrising. 5.1. The pacific warrior: 7 things we can do for change the world. 5.2. Action and Supervision theory. 5.3. Roles and participatory leadership. 6.4. Get the results from the feedback and learning process. 7.2. Innovation in people and organisations. 7.3. Innovation and sustainability planning. *Permacultura Cantabria will be responsible for financial control. *Each partner must report their expenses at the end of each month with supporting documents (scanned invoices issued to their organisation) to Permacultura Cantabria.Thus, we can plan possible revisions between budget items. *Original documents may be requested during the controls, the Partner is liable to submit original copies of the documents and to keep accounting reports.The Commission may carry out inspections or evaluations within 5 years as of the date of application of the contract and the date on which the person is paid (as the total budget exceedsEUR 60 000). *Partners are allowed to adjust the estimated budget by transfers between the differentbudget categories. The Coordinator and the Partners are allowed to transfer up to 20% of the funds allocated for project management and transnational project meetings, intellectual outputs, multiplier activities, learning/teaching/training activities and exceptional costs to any budget category except project management and implementation costs and exceptional costs. Transfers may result with 20% increase at most on the amount set out in the following table. Approval of the Coordinator is required for each budget transfer. Budget allocation per organisation as indicated in this section is not obligatory and may be modified by the beneficiary under the condition that the activities and outputs of the project are realised and delivered in accordance with this Grant Agreement and the work plan presented in the corresponding application form. *If any deduction is made in the budget due to a failure by the partner to fulfill its obligations and/ or of a negligence, this amount shall be deducted from the budget of the partner. In case the next payment to be made does not suffice for the deduction, the Partner hereby accepts and undertakes to make this payment in cash. The Project runs for 24 months starting on 01/09/2018 and finishing on 31/08/2020. By 31/03/2019, the coordinator must complete a progress report on the implementation of the Project, covering the reporting period from the beginning of the implementation of the Project specified in Article I.2.2 to 01/03/2019. By 01/10/2019, the coordinator must complete a progress report on the implementation of the Project, covering the reporting period from 01/03/2019 to 01/09/2019. *Within 60 days after the end date of the Project, the coordinator must complete a final report on the implementation of the Project, and, when applicable, upload all project results in the Erasmus+ Project Results Platform (research, etc). *The coordinator must use the Mobility Tool+ to record all information in relation to the activities undertaken under the Project, and to complete and submit the Interim and Final reports. *All requests for payments and reports must be submitted in English. – Supporting documents: proof of activities undertaken and outputs produced will be provided in the form of a description of these activities and outputs in the final report. In addition, outputs produced will be uploaded by the coordinator in the Erasmus+ Project Results Platform. – Reporting: on behalf of the Project as a whole, the coordinator must report on the final distribution of funds and on undertaken activities and results. – For travel taking place between the sending organisation and the receiving organisation: proof of attendance of the activity in the form of a declaration signed by the receiving organisation(attendance certificate in annexes). – Detailed agenda and any documents used or distributed at the transnational project meeting. * In case of travel from a place different than that where the sending organisation is located and/or travel to a place different than that where the receiving organisation is located which leads to a change of distance band, the actual travel itinerary shall be supported with travel tickets or other invoices specifying the place of departure and the place of arrival. Beneficiaries must not subcontract any activities funded from the budget category Intellectual outputs. -Proof of the nature of the relationship between the person and the beneficiary concerned (such as type of employment contract, voluntary work, SME ownership, etc. ), as registered in the official records of the beneficiary. In all cases, the beneficiaries must be able to demonstrate the formal link with the person concerned, whether he/she is involved in the Project on a professional or voluntary basis. Persons working for a beneficiary on the basis of service contract (e.g. translators, web designer etc.) are not considered as staff of the organisation concerned. -A time sheet per person (in annexes), identifying the name of the person, the category of staff (see the tables below), the dates and the total number of days of work of the person for the production of the intellectual output. On behalf of the Project as a whole, the coordinator must report on the activities undertaken and results produced. The coordinator must include information on the start and end date and on the number of days of work per category of staff for each of the beneficiaries cooperating directly on the development of intellectual outputs. – Detailed agenda and any documents used or distributed at the multiplier event. – In the case that the beneficiaries do not develop the intellectual outputs applied for and approved by the NA, the related Multiplier events will not be considered eligible for grant support either. 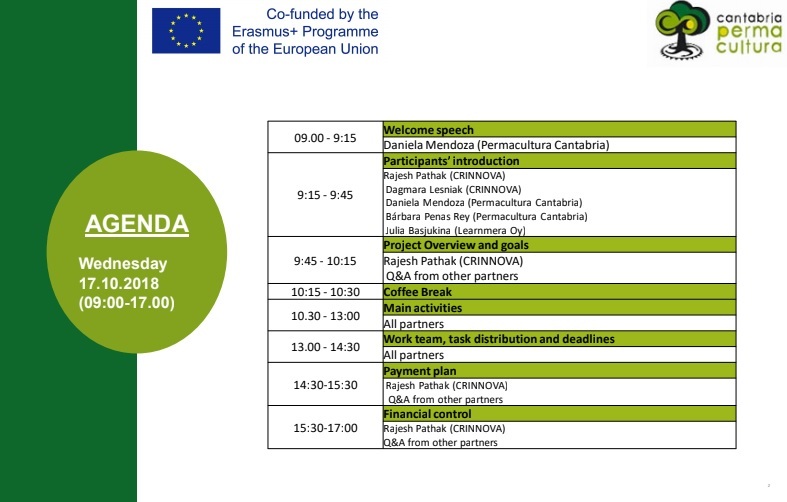 Permacultura Cantabria hosted the kick off meeting, which was attended by representatives from 3 European entities. The main aim of this strategic partnership is to equip adult trainers and adults with new knowledge and tools for them to start developing innovative and sustainable projects in a collaborative way; as well as fomenting entrepreneurship and social inclusion among local citizens. 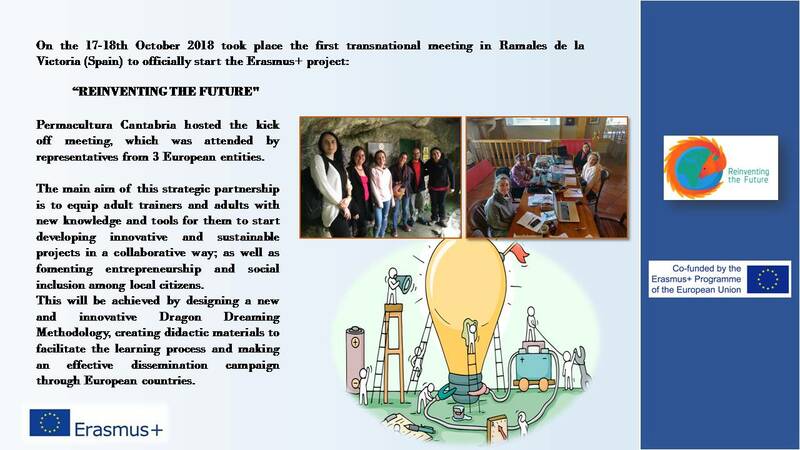 This will be achieved by designing a new and innovative Dragon Dreaming Methodology, creating didactic materials to facilitate the learning process and making an effective dissemination campaign through European countries. © 2018 Copyright by Permacultura Cantabria All rights reserved.